As advisory committee meetings grow more difficult - and more political - and drug sponsors receive shorter notice to prepare, a “win” from a panel has become increasing difficult. With a huge investment on the line, learn how to put your best foot forward. 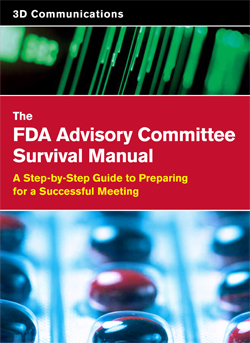 The FDA Advisory Committee Manual is a 159-page book written by 3D Communications to help prepare and guide companies through the FDA advisory committee approval process. Click here to order your copy today. Getting a medical device or drug to market has never been tougher, more time-consuming, or more expensive. It’s estimated that it now costs pharmaceutical companies as much as $2 billion and more than 14 years to get a product from discovery to sales. Despite this enormous investment of time and money, the success rate for getting new drugs approved by the FDA is declining. Increasing product withdrawals and recalls, heightened concerns about patient safety, and a maelstrom of criticism around the FDA and the pharmaceutical industry have created a climate of public fear and mistrust. As a result, the FDA is requiring companies to provide more data and often to present their data at highprofile, emotionally charged FDA advisory committee meetings — hearings that often determine whether the product will ultimately gain approval. clearly communicating the story around the product in a way that helps convince the committee that the sponsor’s program supports a favorable benefit-to-risk ratio. More than anything else, advisory committee preparation requires that companies organize a dedicated, focused team that plans to win — but works as if it’s one step away from losing.